Wash and dry lettuce carefully. I strongly recommend wrapping the torn lettuce in a generous amount of paper towels and chilling in the fridge for at least 1 1/2 hours. 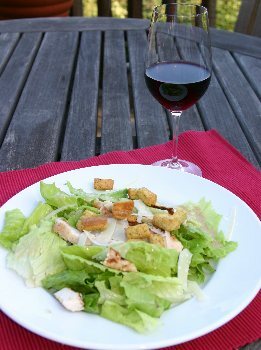 I have found that getting truly chilled, crisp, and bone-DRY lettuce is the key to a great Caesar Salad, almost as much as the dressing itself. Crush the garlic and anchovies together until they are a fine paste. Whisk in other ingredients rapidly. Toss salad, shave parmesean cheese and add croutons at the last minute do not let lettuce sit with dressing on it or it will wilt. Season with ground pepper to taste.